This post The ?Shadow? Interest Rate Is Flashing Red appeared first on Daily Reckoning. Word came down shortly before 2 p.m.
As expected, the Federal Reserve has raised its target rate… to between 1.75% and 2%. It plans two additional rate hikes this year. But has the Fed already tightened too much? And has it just crossed a dangerous threshold that nearly guarantees recession? One obscure economic indicator suggests it has…. Today we enter the statistical ?shadows?… shine a light through the murk? and illuminate worrying facts. The fed funds rate is the rate at which banks lend to each other overnight? and the rate that now rises to 2%. Many traditional models incorporate the effects of the federal funds rate upon economic conditions. But the Federal Reserve hounded that rate all the way to zero after the great financial crisis. And conventional analysis begins to fail at the zero bound. Thus the world of economics entered a twilight zone where familiar reference points fade? and finally fall away. But University of Chicago economists Jing Cynthia Wu and Fan Dora Xia were determined to penetrate the darkness at the zero bound. What if we developed an interest rate model that accounted for quantitative easing's loosening effects? When the federal funds rate hovers near zero, many economic models stop working. Researchers developed a ?shadow rate? that can stand in for the fed funds rate, drop into negative territory and make those models functional again. What did the shadow rate reveal? In mid-2009, after QE 1 entered high gear? the shadow rate turned negative. Rounds two and three pummeled the shadow rate all the way to minus 3% by mid-2014. Here you are ? if you follow the official rate's extended shadow. The chart reveals an additional fact of capital significance? The shadow rate began a steep rise in late 2014 ? over one full year before Janet Yellen raised the actual fed funds rate in December 2015. 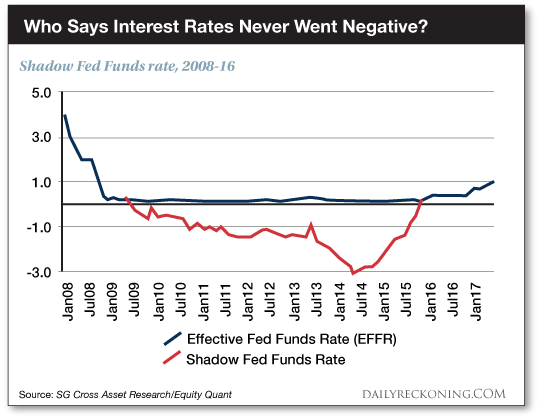 From a negative 3% in mid-2014, the shadow rate spiked to just negative 0.74% in September 2015. It converged with the fed funds rate that December? and has matched it in positive territory ever since. Why did the shadow rate rise so steeply over a year before the official rate? The Fed announced the end of quantitative easing in late 2014. And Janet Yellen began jawboning rates higher with ?forward guidance? ? insinuating that higher rates were on the way in 2015. Thus financial conditions began to bite? and the shadow rate began its rise. If we therefore consider the shadow rate, the Fed began tightening not in 2015? but sometime in 2014. Because the current tightening cycle may be far more mature ? and intense ? than most realize. The Fed has undertaken 12 tightening cycles since 1955. Each cycle has averaged two years. The current cycle is officially 2.5 years old. But if we account for the shadow rate? the current cycle is nearly four years old. Meantime, previous tightening cycles averaged roughly 3 percentage points, trough to peak. The current cycle has covered the first two… implying the Fed is only two-thirds home. But consider the shadow rate? Recall that it bottomed at negative 3% in 2014. Like the official rate, it now rests between 1.75% and 2%. That is nearly 5 full percentage points off its 2014 low ? far exceeding the historical average. 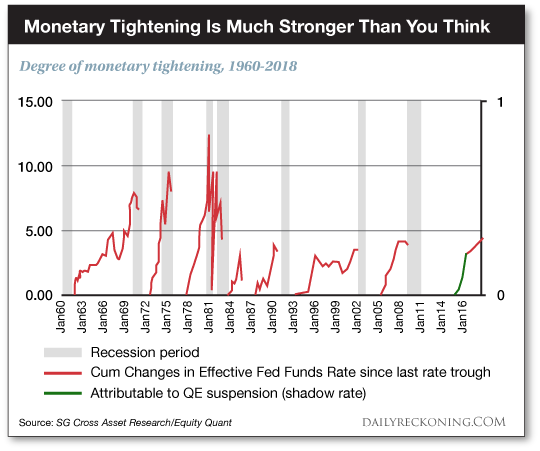 The current tightening cycle may therefore be much more intense than generally realized. It is therefore reasonable to argue that the U.S. has already faced a ?normal? tightening cycle and any additional rate hikes are taking us into territory not seen in recent times. This already may be enough for the Fed to have broken something. Has the Fed already ?broken something?? And might additional tightening shatter something? The following chart reveals that on each occasion tightening approached 5 percentage points… recession was close by. As of today, the shadow rate has traveled the full five points. The Fed is on track to raise the fed funds rate to 3% by late next year… implying a walloping 6-point increase in the shadow rate. At what point will some hinge give way… somewhere in the financial system? But the shadow rate flashes its warning. The post The ?Shadow? Interest Rate Is Flashing Red appeared first on Daily Reckoning.